NECA presents the definitive collector’s version of Jason from Friday the 13: A New Beginning! This is Jason as he appears in the nightmares that haunt Tommy, who has been living in mental institutions since he killed Jason in Part 4. This deluxe 7” scale action figure features over 25 points of articulation and comes with 4 unique, interchangeable heads to represent different dreams (bloody mask, resurrection mask, grave mask and a special mask based on the one-sheet poster). It’s also packed with accessories--machete, axe, ice pick, and tombstone. 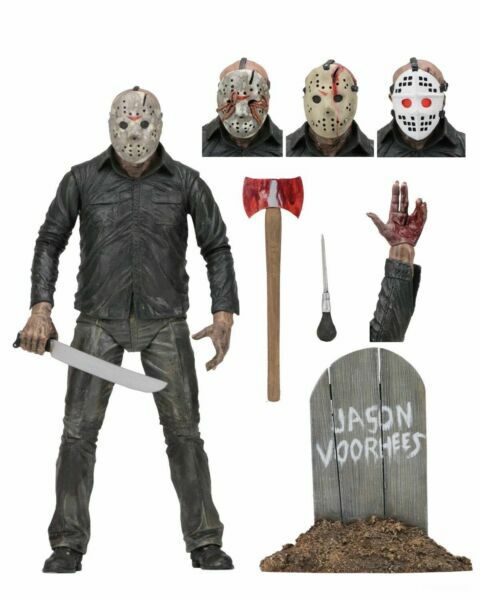 Bonus: includes an extra left hand with split fingers that can be used with this figure or the Ultimate Part 4 Jason! Comes in a display-friendly deluxe window box with opening flap. All orders will be shipped with tracking numbers. We ship Monday through Friday from 10 am - 5 pm EST excluding holidays. Any orders placed after 12pm on Friday will be shipped the following Monday. Items of unusual size or weight may be shipped differently than normal orders. Any differences in shipping will be noted within the product listing under the shipping section. Shipping prices are not negotiable. We support cart-style shopping, so if you add multiple items to your cart, you'll receive a certain discount on shipping charges. If you click on BUY IT NOW we will not be able to combine your shipping charge. We can only offer combined shipping for CART-style purchases. If you make individual purchases we will NOT be able to combine shipping charges. Stay tuned for more items to be added to our combined shipping policies. Prices are subject to change without notice. Shipping Surcharges - A $3.95 shipping rate surcharge will be added to all Alaska & Hawaii addresses. A $1.95 shipping rate surcharge will be added to all APO/FPO addresses. Returns are accepted within 30, and we offer Money Back. Buyers are responsible for shipping merchandise back to us.